Why BrandTech Dispensette 3 bottletop dispensers can save you hundreds in grant money on reagents and the purchase of unnecessary pipette repeaters. BrandTech Dispensette 3 bottletop dispenser can be your lab’s solution. Are you constantly dispensing the same amount of solution 2-3 times a day, five days a week with a repeater? What if you had the option of using an alternative product that guarantees the same precise results of a repeater minus the stress of your poor thumb and sanity? Bottle top dispensers can be used in any laboratory where measured amounts of liquids are needed, including biology, chemistry, food & beverage, mining, petrochemical, and wasterwater labs. According to Jakub Latusek, BrandTech®’s Distributor Relations Manager, “Choosing a bottle top dispenser versus a repeater comes down to preference and convenience of each particular application. When it comes down to it, if you are dispensing the same reagent regularly, it’s generally easier to attach a dispenser to a stock reagent bottle instead of pouring into smaller bottles and risking a hazardous spill.” If you know the volume of liquid you’re dispensing, save yourself the tedious repetition and stress to your thumb, use a Dispensette® bottle top dispenser. Bottle top dispensers can be used to dispense acids, bases, solvents, saline, and culture media. If you’re dispensing the same amount of liquid at a continuous rate, a Dispensette® bottle top dispense is a better alternative than pipette repeaters. Why? Imagine sitting in your station using a repeater pipette – pressing down on the lever 200 times in one day. Not only will the fatigue in your thumb and hand drastically reduce the precision of your results but it will also increase your chances for RSI. Fortunately, the Dispensette® bottle top dispenser is evenly balanced which means it maximizes your productivity by reducing the amount of times you have to dispense a liquid. Its flexibility reduce the stress in your thumb and hand without sacrificing precision. BRAND Dispensette® bottle top dispenser is a reliable and easy-to-use bottle top dispenser that can be used in nearly any chemical lab. It saves time and effort for those dispensing the same reagents regularly. The Dispensette® bottletop dispenser comes in three different versions for compatibility with most reagents in your lab. 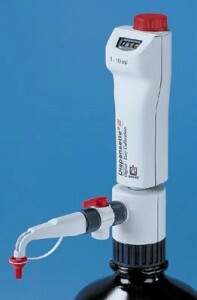 The Dispensette® III is suitable for bases, non-concentrated acids, saline solutions, and many solvents. The Dispensette® Organic can be used to dispense organic solvents, concentrated acids, and peroxides. Finally, the Dispensette® TA is recommended for trace analysis (PPB and PPT) chemical dispensing, high purity solvents, and acids such as hydrofluoric acid (when used with the platinum-iridium valve spring). Demo a Brandtech Dispensette® 3 bottletop dispenser and see the difference in your results and your thumb load! To see a complete list of BrandTech® bottletop dispensers, the latest special, or to place an order, visit Pipette.com’s Dispensette III Bottletop Dispenser page or call 800-243-3232, today!